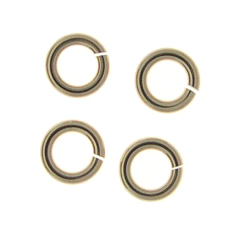 Snapeez Snapping Jump rings! Turn an open jump ring into closed - with no solder - just a brush, snap and wiggle!! I'm truly amazed.. these are incredible! IMPORTANT NOTE: These are not intended to be used with beading wire.. but more for things like connecting charms to bracelets, creating extenders for chain, connecting clasps to chain, etc. Because a small gap remains, they are not suitable for beading wire!. Gold-Filled, 8mm, sold in packs of 25.